Mildred was born in Puerto Rico and came to the United States in 2010. While living in Puerto Rico, Mildred was a nurse in a retirement home for 12 years. 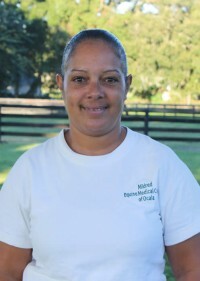 Mildred started working at Equine Medical Center in March 2012 and loves being part of the EMCO family. She single handedly keeps the clinic building, intern and extern houses clean. Mildred is proud to be the mother of 3 beautiful sons and the grandmother to 6 wonderful grandchildren. In her spare time, Mildred loves keeping in contact with her family all over the world via Facebook. She also enjoys going to church and spending time with her husband of 7 years.